These stylish rollers mowers are packed full of premium features often found on more expensive models. 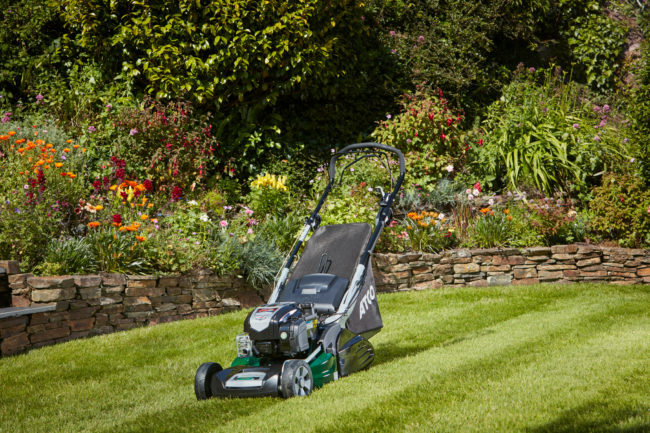 With a 48cm (19”) cutting width and powered by a choice of Briggs & Stratton engines; the 675EXi Readystart on the liner 19S V or the advanced 675IS InStart push button electric on the liner 19SE V.
Featuring the innovative Twinclip blade with four cutting edges, the leading edge reduces the initial length of the grass with the following edge reducing the finished length down to the desired height. The extra finely cut clippings are the blown into the large 80 litre collector resulting in a noticeable increase in extra mowing capacity. The large diameter steel rear roller is driven by a heavy duty Hi-Torque cone clutch transmission with a torque converter which combines light and easy operation with smooth acceleration through a range of cutting speeds from 3km/h to 4.4km/h. Cleaning after us is facilitated using a hose connection fitted to the chassis. The robust handles are quickly and easily adjusted to a choice of 3 different heights making it easy to find the most comfortable position for use.